Cows on The Fields property look warily at an interloper on Monday. 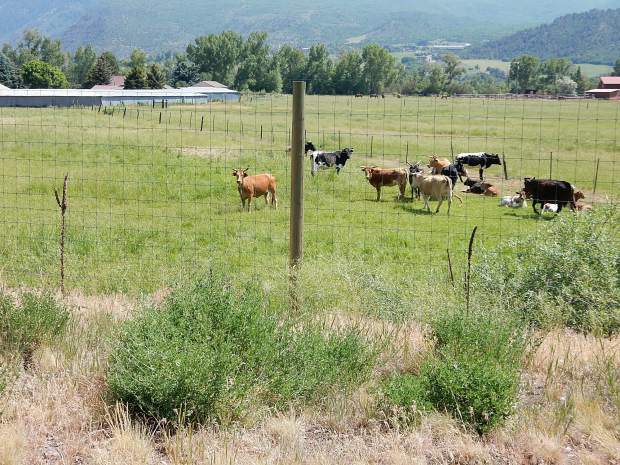 The density on The Fields site along Highway 82 in the mid valley has been a major discussion for the Roaring Fork Valley Regional Planning Commission. The public is being invited to weigh in Thursday on a master plan that will help determine the level of development allowed at The Fields and other sites in the midvalley for several years to come. 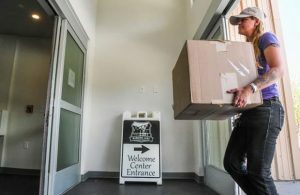 The Roaring Fork Valley Regional Planning Commission is ready to start review of the final draft of the Mid-Valley Area Community Plan after six months of debate. At its last meeting May 17, the commission focused on how much development to recommend on 10 specific properties. The master plan will be used as a guide if and when development proposals are made on those sites. The fate of The Fields dominated the discussion May 17. The commission was split 3-2 over how much development to favor on the 19-acre site west of the Summit Vista subdivision and across Highway 82 from the entrance to the Blue Lake subdivision. Planning commission members Curtis Vaughn, Robert Andre and Michael Luciano voted to place a designation on the property that would allow five to seven residential units per acre. Planning commission members Temple Glassier and Charles Spickert argued that the site should have a lower density because it is a transition zone between high density and large, rural lots. They voted for a designation that would allow two to four residential units per acre. Luciano said the developers of The Fields would be able to offer more housing at affordable prices if they are able to build more units. He also said development on the south side of Highway 82 makes more sense than development on the north side because a lot of the traffic will head upvalley and have an easier time entering the highway from the south. Glassier countered that the roads in the midvalley are at or near capacity, so it doesn’t make sense to keep adding traffic. “The roads are atrocious,” she said. The Fields site also was the subject of debate when the master plan was last examined in 2013. Cliff Simonton, a planner with Eagle County, said the owners “pleaded” with the planning commission at that time to designate a higher density on the site rather than retain the large lot designation. The planning commission wanted to seek opinions from neighbors, so it sent out letters to more than 70 adjacent property owners seeking input. There were no objections at that time to the higher density, so the planning commission honored the owners’ request, Simonton said. Vaughn said given that history, he was willing to maintain the higher density designation on the property. For an inexplicable reason, Simonton skipped more recent history of The Fields. The owners applied in 2015 to build 97 to 110 residences on the property. Scores of neighbors from Summit Vista and other adjacent neighborhoods spoke out against the project, most contending it was too dense and out of character with the immediate surrounding area. Summit Vista has 50 homes on 21 acres. The planning commission voted 4-1 in December 2015 to recommend denial of the project during the first round of review. The county commissioners voted 3-0 to approve that first round, called sketch plan review. However, The Fields was caught in a moratorium during work on the midvalley master plan. The owners can advance to the second round of review when the moratorium expires this summer. Vaughn, Andre and Luciano are all newcomers to the midvalley planning commission and didn’t participate in any public hearings on The Fields. It was unclear at the May 17 meeting if they were aware of the project’s history and the widespread opposition from neighbors. Spickert said at the May 17 meeting the lower density is a good compromise on the site. “We’re not saying they can’t do a residential project there. The scale just needs to be appropriate,” he said. “As far as affordability, we need to maintain that higher designation,” he said. Whit Whitaker, another of the partners in The Fields, said they wanted to “hit the middle of the road” with density. Three residents of Summit Vista attended the meeting and urged the planning commission to designate the property for a lower level of density, to no avail. The planning commission will review its revisions to the master plan at Thursday’s meeting, which starts at 5:30 p.m. at the Eagle County office building in El Jebel, adjacent to Crown Mountain Park. Public comment will be taken as part of the meeting. Adoption of the plan is tentatively scheduled for another meeting June 21.